A 3 year old female, larger head relative to rest of the body. Product of non consanguineous marriage. Clinical and neurological examination shows delayed milestones, walking imbalance. History of similar illness in elder sister. Diffuses cerebral white matter involvement. Early involvement of sub cortical white matter. Sub cortical white matter cysts iso intense to Csf representing white matter paucity in temporal regions. Basal ganglia and internal capsules spared. Minimal involvement of Cerebellar white matter. On MRS reduced NAA and slightly raised Choline peak. Imaging findings of bilateral diffuse white matter disease, involvement sub cortical white matter with cysts, sparing basal ganglia and internal capsules with Macrocephaly clinically goes in favour of Van der Knaap disease. 1. MLC: Megaloencephalic leukoencephalopathy with subcortical cysts, formerly known as Vacuolating megaloencephalic leukoencephalopathy with benign, slowly progressive course. 3. WML: White matter disease with lactate. 4. H-ABC: Hypomyelination with atrophy of the basal ganglia (BG) and cerebellum. Swollen WM involvement is diffuse, includes subcortical U-fibers. Subcortical cysts makred in anterior temporal and fronto parietal white matter. WM replaced by CSF signal, involvement is diffuse WM, includes subcortical U-fibers. BG and thalami not involved. Diffuse periventricular, deep cerebral WM. Posterior corpus callosum and posterior limb of internal capsule involved. In Brainstem cerebral Peduncles, pyramidal tracts, medial lemniscus, intraparenchymal trajectories of trigeminal nerves, anterior spinocerebellar tracts involved. Cerebellar WM involved later, but then notably abnormal. Spinal involvement an important feature. In spine dorsal columns and lateral corticospinal tracts involvement is typical. Atrophy of BG and cerebellum. Diffuse hypomyelination of cerebral WM. In all varieties involved WM show reduced attenuation. No contrast-enhancement. In MLC: Anterotemporal and frontoparietal subcortical cysts approximate CSF signal. In VWM: Involved WM approximates CSF signal. No contrast-enhancement on post contrast study. DDs of macrocephaly with diffuse leukoencephalopathy is limited includes Canavan disease, Alexander disease, infantile-onset GM2 gangliosidosis and laminin alpha-2 (merosin) deficiency. Laminin alpha 2 deficiency: The white matter disease in laminin alpha-2 deficiency most closely resembles that observed in MLC; however, the typical subcortical cysts of van der Knaap are lacking. Individuals with laminin alpha-2 deficiency have prominent weakness and hypotonia, not seen with MLC - van der Knaap. Molecular genetic testing will be confirmative. Canavan disease: Typically shows involvement of the thalamus and globus pallidus with relative sparing of Putamen and caudate nucleus. The globus pallidus and thalamus are not involved in MLC. 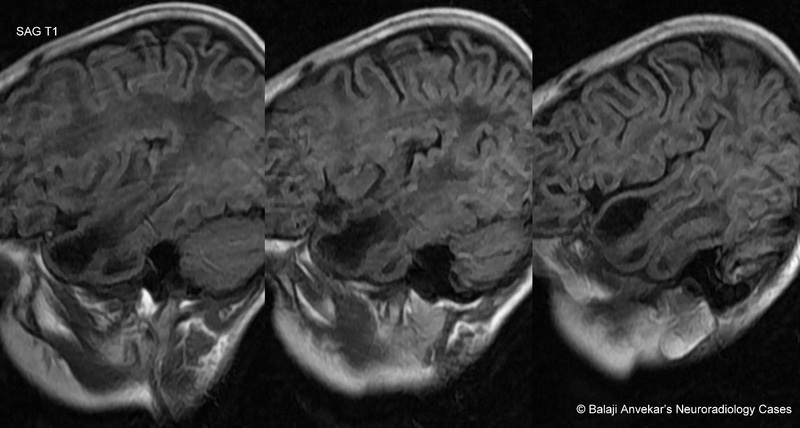 The white matter may be cystic in Canavan disease, but the typical subcortical cysts seen in MLC are lacking. Confrmation of Canavan disease possible by demonstration of very high concentration of NAA in the urine and/or molecular genetic testing of ASPA. Alexander disease: Megalencephaly and leukoencephalopathy with frontal predominance on MRI is typical with contrast enhancement of particular brain structures not a feature of MLC. Cystic degeneration may occur in Alexander disease, but the location of the cysts is frontal. Alexander disease can be confirmed by molecular genetic testing of GFAP. 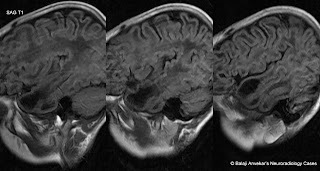 Infantile GM2 gangliosidosis: MRI characterized by prominent involvement of the basal ganglia and thalami in addition to the white matter abnormalities. Demonstration of assaying hexosaminidase A and B in serum, leukocytes, or cultured skin fibroblast will be confirmtative. VWM: Recessive inheritance; gene on 3q27,mutations in genes that encode eIF2B subunits: EIF2Bl-S.
WML: Autosomal recessive inheritance likely. MLC and VWM rare, but carrier rate is high in some communities with high levels consanguinity. Common MLC mutations in specific Indian community (Agarwal), Libyan Jewish, and Turkish populations due to founder effect. Common VWM mutations in certain regions of Netherlands. MLC: Macrocephaly. Delayed onset slow motor deterioration. Slower cognitive decline.Cerebellar ataxia and pyramidal tract involvement, motor deterioration, seizures. 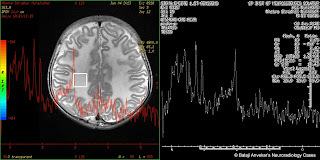 VWM: Episodes of major deterioration and coma following infection or minor head trauma. Relatively preserved cognition. H-ABC: Progressive extrapyramidal symptom like ataxia. Prevention of Secondary Complications from minor head trauma. Evaluation of Relatives at Risk with Genetic Counseling. Reference : Diagnostic Imaging Osborn.